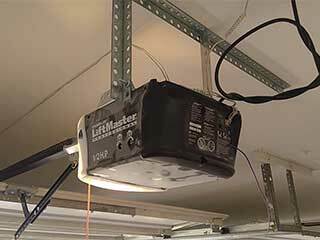 A garage door opener is one of those machines we often take for granted, even though it makes our lives remarkably convenient. When this device starts to malfunction for whatever reason, it will be impossible to ignore it. Understanding what some of the most common problems that you could encounter will help you deal with these scenarios should they happen. If your opener has been manufactured after 1993 (and, god, we hope it was) that it should have certain safety features in place that are meant to keep it from closing the door while there's an obstacle blocking its path. The most common application of this feature is the use of safety sensors. These components are in charge of detecting obstacles that get in the door's path, which is why they are installed on each side of the opening to the garage. If they detect an obstacle while the door is trying to close, the opener will reverse the door. That's all well and good, however, misaligned sensors can cause your door to reverse even though there is no actual obstacle in its way. The solution to this problem is to have them carefully realigned by a professional technician. These are delicate components, so an expert is required to make sure they don't get damaged in the process. This type of malfunction is most likely caused by a wrong travel limit. This feature is what essentially tells the opener how far up or down the door needs to go. If it isn't set correctly or changes for whatever reason, then the door may only open part way, or leave a gap while closing. One of our experts can easily adjust your opener travel limit and make sure that your garage stays secure and doesn't leave any open gaps. If your opener makes a whirring drone but the door doesn't move anywhere, then the problem is probably with the gear. Unfortunately, a worn out motor gear will render your door inoperable, at least not automatically. The solution to this issue is simply to get the motor gear replaced. This type of problem is perhaps the most common one. There could be several causes here. For once, the remote could have lost its calibration with the opener and will need to be reprogrammed in order to be able to communicate with it again. This problem could also be the result of physical damage to one or more of the remote's interior components. If the damage is beyond repair, you'll have to get a new remote. Last but not least, the most common issue is also the one that's most easily solved. Dead batteries. Yes, that's right. You'd be surprised as to how often people forget to check for this. Obviously, simply replacing the batteries should do the trick. If you find yourself experiencing an opener related problem, whether one of the ones mentioned above or any other type, don't hesitate to give our team at Garage Door Repair Carlsbad a call right away.